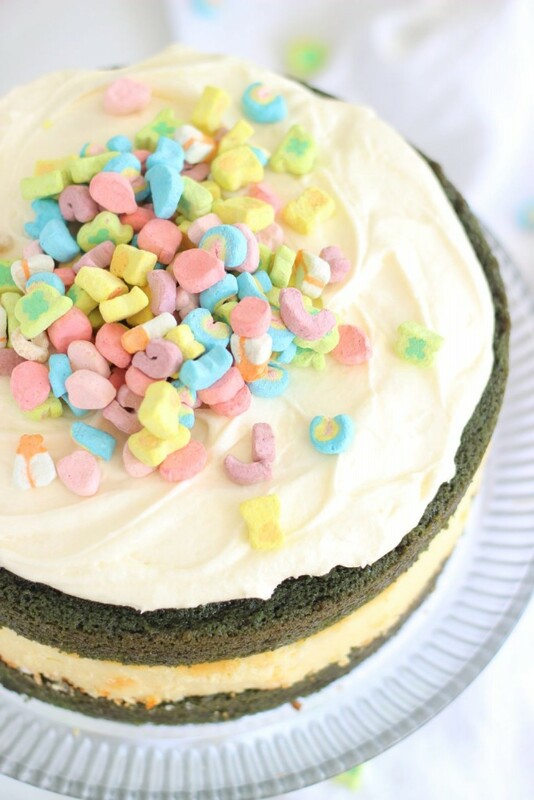 Layers of green velvet cake, sandwiched by a whole cheesecake, and topped with cream cheese frosting and Lucky Charms marshmallows. But let’s start here: why didn’t I start making cheesecake cakes sooner?? Consumed with regret. 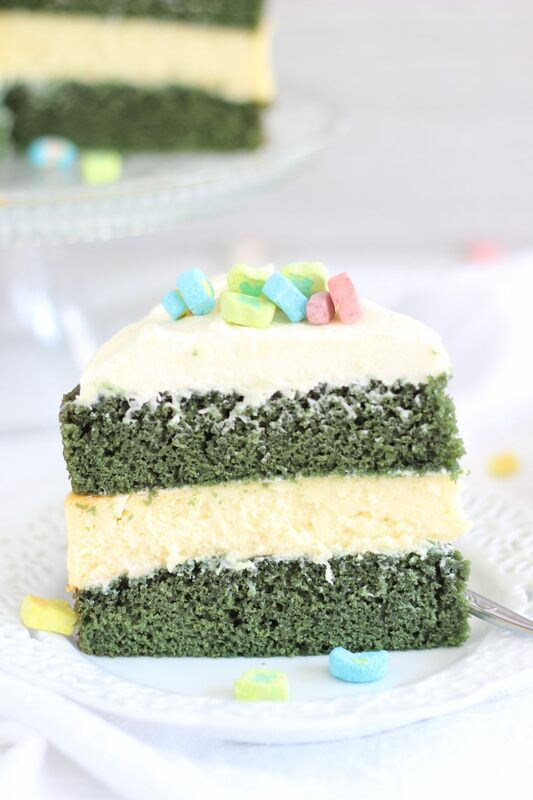 I have hardly loved a cake more than this Green Velvet Cheesecake Cake. I love a basic, but perfected red velvet cake with cream cheese frosting. 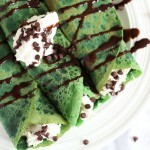 Here, substitute green food coloring. Done. It’s the best red/green velvet cake recipe I’ve ever tried. The cake is to-die-for. I would eat it by itself, even without frosting. I don’t know why someone would eat it that way, but I’m just saying you could, and it would still be totally delicious. 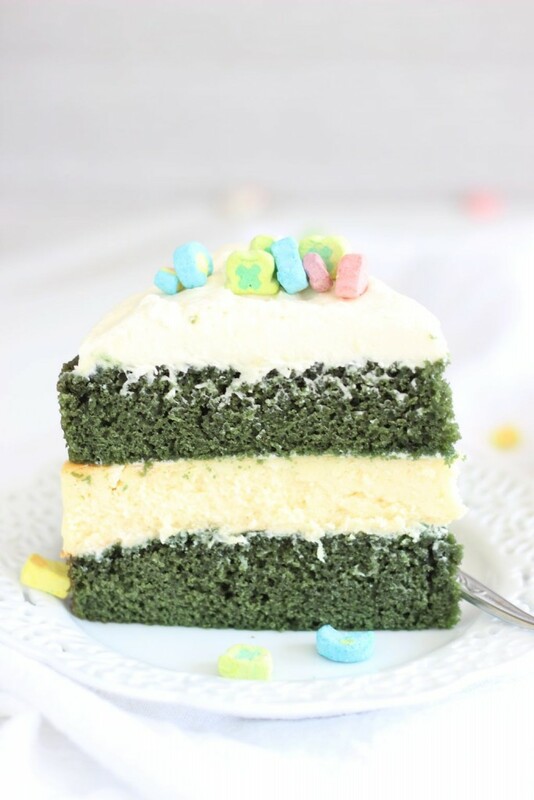 This green velvet cake recipe is probably the only cake in the world that would be acceptable without frosting. I don’t need a lot of frosting anyway, but I do think it’s essential with cake generally. Without it, why bother? My family – they all fight over the corner pieces of cake, and they clamor for more frosting. I like a solid amount, but I don’t want heaps. This has a generous mound on top, and that’s that. It’s just the right amount. Especially because there’s a cheesecake in the center of this cake. A full, whole, entire cheesecake fills this layer cake. Sounds excessive? It’s not. It’s grand. Cheesecake is a long-standing favorite dessert in my house. I have categories of cheesecake recipes. I have everyday cheesecakes, special occasion cheesecakes, no-bakes, and everything in-between. Except maybe savory. I’m really not about that life. Cheesecake should always be sweet! The cheesecake in the center of this cake is my absolute favorite, top-notch, can’t-be-improved-upon cheesecake recipe. 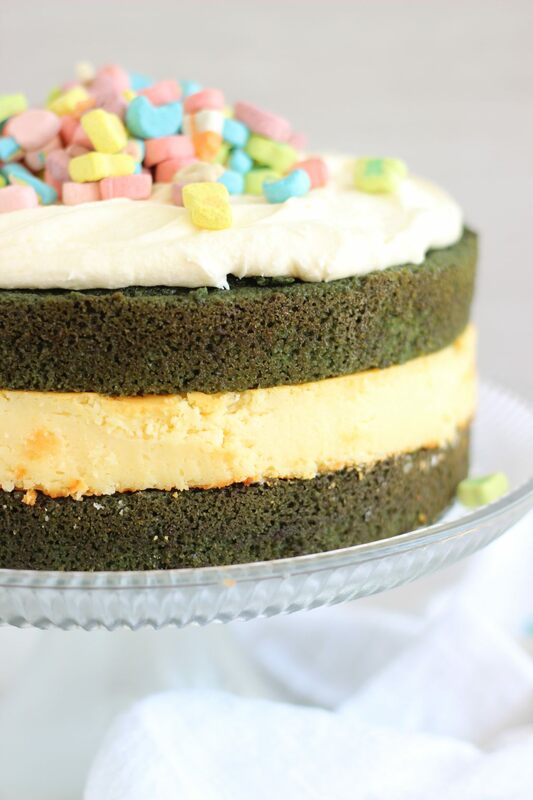 Altogether, this Green Velvet Cheesecake Cake is the best of everything. 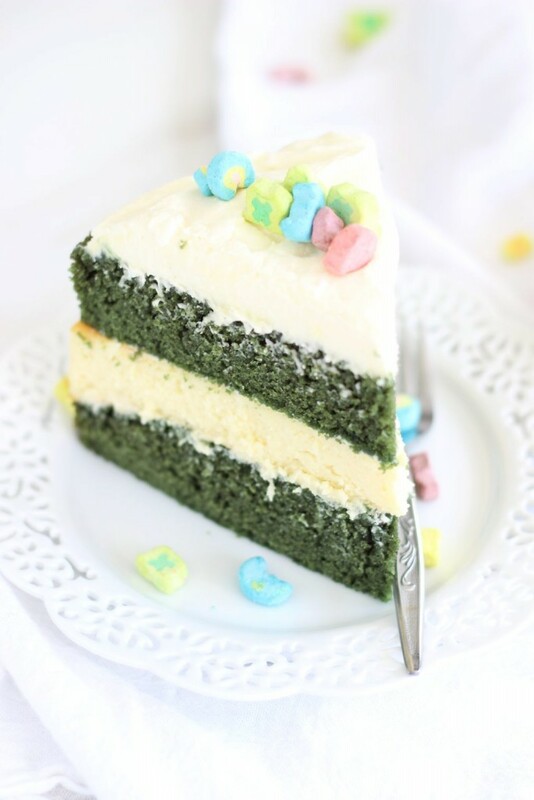 Lots of rich cream cheese frosting, a creamy cheesecake in the center, and the most moist and wonderful green velvet cake. If that’s not enough for you though, I piled it high with Lucky Charms marshmallows, just for fun! 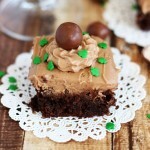 In a large bowl, combine flour, cocoa powder, baking powder, baking soda, and salt. In a medium bowl, combine buttermilk, green food coloring, and vanilla. In a large mixing bowl, beat sugar and butter until light and fluffy, about 3 minutes. Add eggs, and beat until well-combined. Add the dry ingredients and the buttermilk mixture to the mixing bowl, alternating. Divide the batter evenly between two well-greased 8-inch round cake pans. Bake at 350 degrees for about 25 minutes, or until the edges are golden, and a toothpick inserted near the center comes out clean. Cool for 20 minutes in the pans before removing to wire racks to cool completely. While the cakes cool, prepare and bake the cheesecake. Pour batter into a well-greased 8-inch springform pan. Bake at 325 degrees for 45-50 minutes, or until edges are golden brown and slightly puffy, and the center is still slightly jiggly. Remove from heat, and set on a wire rack or trivet to cool completely. Release the sides of the springform pan, and loosen the cheesecake from the bottom of the springform pan, but don't move it. Meanwhile, prepare cream cheese frosting. In a large mixing bowl, beat cream cheese and butter until smooth and creamy. Add powdered sugar and vanilla extract, beating until fluffy. 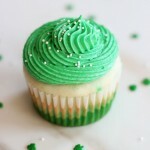 Place first green velvet cake layer on a cake plate or cake stand. Spread with a thin and even layer of cream cheese frosting - doesn't have to be perfectly neat. Carefully shift the cheesecake on top of the first cake layer. If it's slightly bigger than the cake, then trim the edges with a serrated knife. Spread the cheesecake layer with a thin and even layer of frosting. 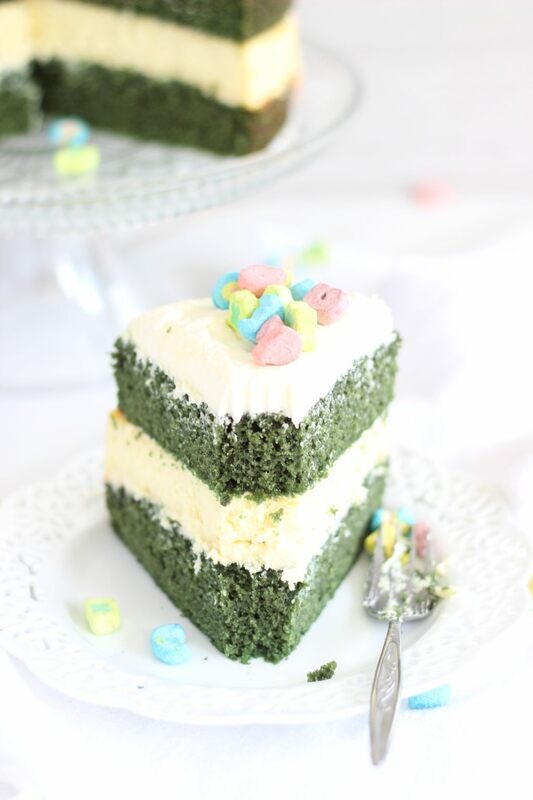 Top with the second green velvet cake layer. Pile the remaining cream cheese frosting on top of the cake, spreading it almost to the edges. Chill in the refrigerator for at least 1 hour. Cut and serve! 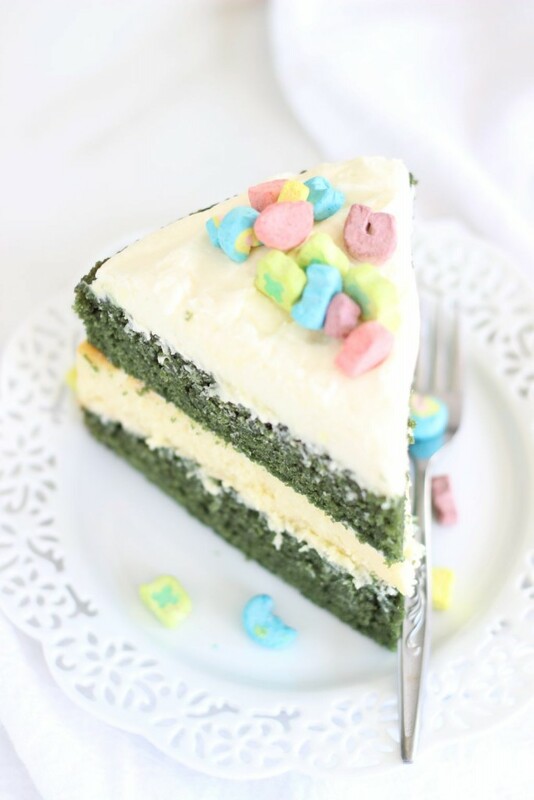 Green Velvet Cake adapted from Food Network. 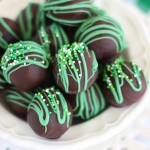 This just screams St. Patty’s Day, doesn’t it!! 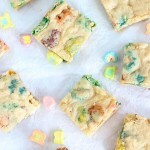 I love the addition of the Lucky Charms on top…so cute! Oh, it looks so pretty! A perfect Easter cake! Oh my goodness! This looks awesome! Pinned! Looks great. 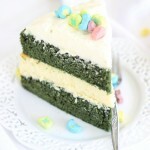 I love the green velvet and I think the cheesecake makes it better overall as I am not a big cake fan. 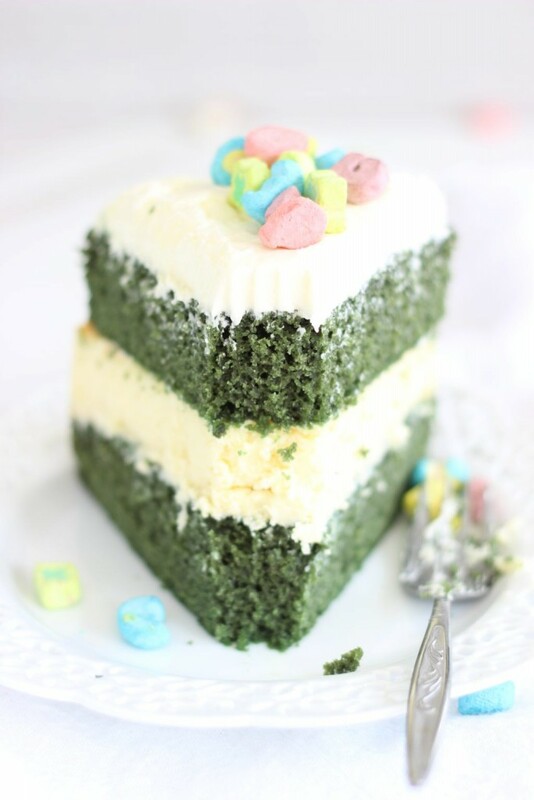 Even if you don’t like cake, the green velvet one is sublime! I’d just leave out the food coloring and this sounds delicious. Thanks for sharing on Creative K Kids Tasty Tuesdays. I hope you will join us for the next party. How cool! 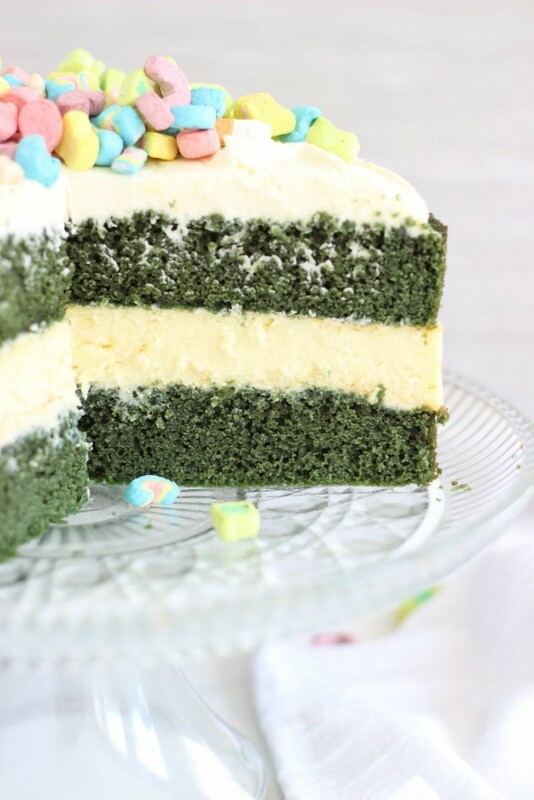 When I first saw the thumbnail picture I thought it was an Easter cake with little bunnies on top, and the cake was kind of like the gras, but your lucky green cheesecake is so cute. Thanks for sharing this at #SaucySaturday, I’m going to pin this for Easter next year! Sounds yummy! Thanks for sharing at the Inspiration Spotlight party. Pinned & shared. I know exactly why I’ve never made cheesecake in cake before – I’d never stop eating it!! This looks fantastic. Adding it to my cheesecake board…and will dream of cheesecake the rest of the day. Thanks for sharing on Weekend Bites.